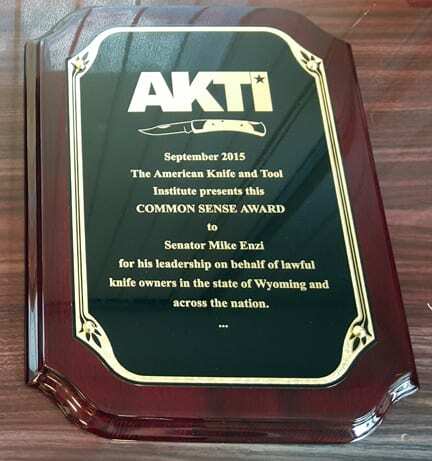 Cody, WY (September 30, 2015) – The American Knife & Tool Institute (AKTI) today presented Senators Mike Enzi, R-WY, and Ron Wyden, D-OR, with the “Common Sense Award.” The award is designed to honor Members of Congress who have worked across party lines to further common sense legislation. 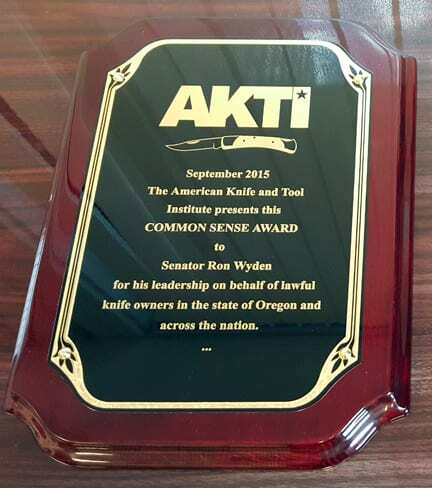 In its first ever presentation, AKTI honored Senators Enzi and Wyden for their tireless work on the Knife Owners’ Protection Act (KOPA), a bill that will ensure federal protection for lawful knife owners from the current patchwork of state and local knife laws. 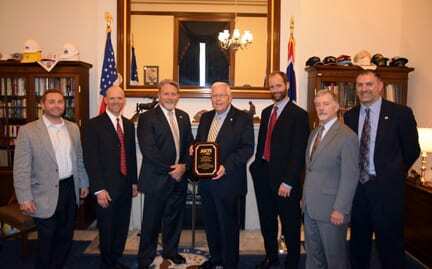 AKTI Board Members in Senator Enzi’s office presenting “Common Sense” Award. 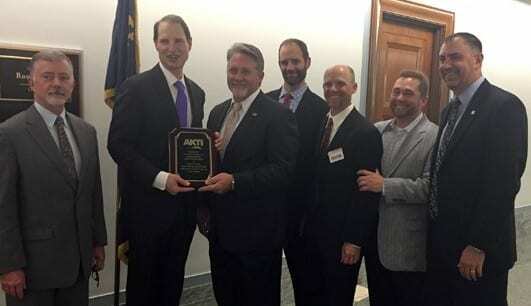 Morgan Taylor (Taylor Brands), Bill Raczkowski (Gerber), CJ Buck (Buck Knives), Senator Enzi, David Fee (Benchmade), Dan Lawson (Microtech) and Mark Schreiber (CRKT). Under current U.S. code, lawful gun owners are allowed to transport firearms legally in both the state of origin and the state of destination, provided they are properly stored and in accordance with all federal restrictions. However, no such protection exists for knife owners wishing to transport knives to and from states in which they are legal, but through jurisdictions with varying requirements. KOPA would allow legal interstate travel for knives, provided the knives are transported to and from states where the law allows possession of said knives, and they are transported in closed containers. The bill, S. 1315, which has passed the Senate Committee on Commerce, Science and Transportation, and is co-sponsored by Senators Mike Lee, R-UT, Joe Manchin, D-WV, John Thune, R-SD, and Martin Heinrich, D-NM. For nearly 20 years, AKTI has served as the go-to resource for knife owners looking to ensure that they comply with all local, state, and federal laws related to knives. One of the biggest complaints and points of confusion AKTI hears about from lawful knife owners involves the interstate transport of knives. While citizens are making every effort to comply with patchwork state and local laws, it has become clear that there is the need for a federal protection for sportsmen, hunters, and other law-abiding knife owners that does not interfere with state and local restrictions on knife use.